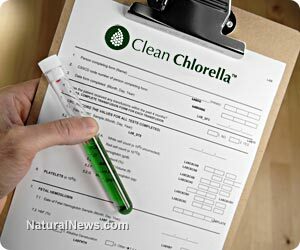 (NaturalNews) As Natural News readers know, we recently announced the availability of Clean Chlorella and explained how it was cleanest chlorella on the planet. Today I'm happy to share with you the actual lab test results which have now been repeated across multiple production batches. These results show the astonishing cleanliness of Clean Chlorella. Why does this matter? Most chlorella is contaminated with trace levels of lead, arsenic, aluminum or cadmium. Our previous round of lab tests showed that chlorella from China was the most polluted, and that mirrors the truth about many other foods from China which are also heavily polluted with lead, arsenic, cadmium, etc. We also showed that certified organic chlorella is no cleaner than non-organic chlorella when it comes to heavy metals. That's because the USDA organic seal does not, in any way, regulate the level of heavy metals present in foods. A food produced in China (or anywhere else) can be USDA certified organic and still contain alarmingly high levels of mercury and other heavy metals. That's why we spent a considerable amount of time -- maybe a year or so -- searching for the cleanest chlorella on the planet. We found two sources that were the cleanest. One was from South Korea and the other from Taiwan. In our lab tests, chlorella from China was the most polluted, and chlorella from Japan was somewhere in the middle. Taiwan produced the cleanest organic chlorella, and South Korea produced the cleanest conventional chlorella. Click here to see the chlorella available at the Natural News store. Precision: This ICP-MS system has a precision level of low ppt (parts per trillion) to high ppt. There is some variation on actual numbers depending on the metal. These tests were conducted in an ICP-MS system: Inductively Coupled Plasma Mass Spectrometry. Digestion was by high pressure microwave digestion running at 30 bar. Calibration was run against standard QC matrices. These results are astonishing. There is nothing cleaner in the world of superfoods. In fact, these are the lowest levels we've seen in ANY superfood, including spirulina, blueberries, seaweed and other items. Click here to view the chlorella products available now at the Natural News store. We invite anyone in the industry to test our chlorella and reproduce these results for yourself. If you do pursue this, make sure you know what you are doing in terms of handling samples, because merely touching the sample vessels can contaminate them with detectable levels (ppb) of metals that are present on your skin. In fact, if you run these tests in a lab that has aluminum edging of the ceiling tiles, microscopic flecks of aluminum can fall from the ceiling directly into the sample vessels, producing a false aluminum reading. Aluminum is the most common of these metals in chlorella. Aluminum is very difficult to avoid because it is common in soils plus it falls out of the sky (chemtrails). 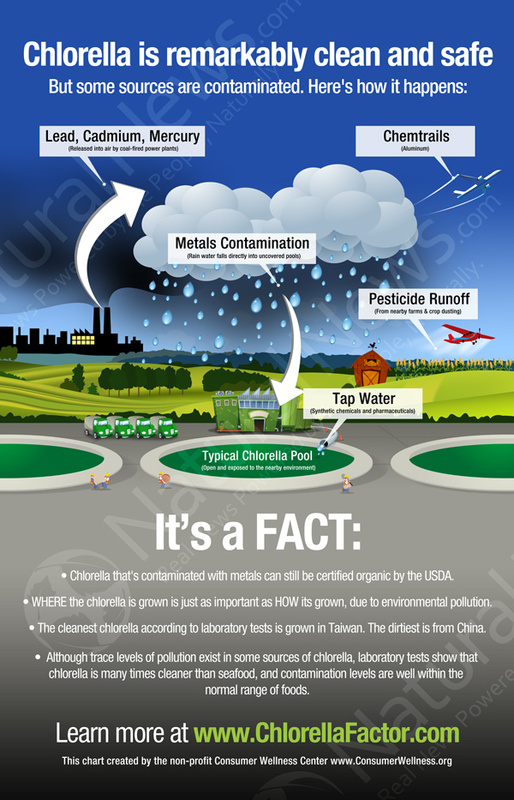 This is why any chlorella grown in outdoor pools will be contaminated with some level of aluminum. How is Clean Chlorella so amazingly clean? This astounding purity of the Natural News Clean Chlorella is achieved by growing the chlorella in an indoor "greenhouse" type of environment where every input is controlled under laboratory conditions. All the water used to grow the chlorella is subjected to ultra high purification. The air that circulates in the growing areas is highly purified to eliminate airborne contaminants. On top of that, all the inputs that are "fed" to the chlorella are also rigorously tested for contaminants. This process is very expensive to construct, but it produces the cleanest chlorella grown anywhere on the planet. This chlorella is cleaner than "organic" chlorella! We challenge anyone in the industry to produce a cleaner chlorella. We also encourage everyone in the industry to publicly release their metals test results and show their customers what they're really buying. • Lead = Retarded brain function, neurological disorders, stunted brain development in children. Gastrointestinal damage, stupor, slurred speech, bluing of gums, aggression in children. • Cadmium = Permanent kidney damage as well as neurological damage. Half-life in the human body is 25 years or so and is extremely difficult to eliminate from the body. Poisons the liver. Causes cancer. Destroys bone health. • Arsenic = Headaches, confusion, convulsions, vomiting, hair loss, liver damage, kidney damage, leading to coma and death. • Mercury = Extreme neurotoxicity, causes permanent brain damage and may be linked to autism. Causes permanent damage to kidneys and lungs. • Aluminum = Dementia, Alzheimer's and neurological disorders. Alzheimer's victim's brains are often found, post-mortem, to contain unusually high levels of aluminum in the "plaque" deposits. Also, even worse, these metals interfere with the absorption of important nutrients. Mercury, for example, interferes with the absorption of selenium and blocks the methylation cycle that's crucial for cellular energy and DNA repair. Cadmium competes with potassium, etc. Of course, eating even the most polluted chlorella won't cause acute metals poisoning just by itself, but what concerns me is the long-term bioaccumulation of heavy metals from multiple sources. It only makes sense to keep your diet as free from these heavy metals as possible. This is especially true when you understand that many people are taking chlorella precisely to clean up their diet and even help support the elimination of contaminants from their bodies. Get some Clean Chlorella now. I was visiting an environmental testing lab just yesterday where they were running four ICP-MS systems, plus some new high-end ultra-trace mercury detection systems. The lab was amazing, with autosamplers and workstations running everywhere. They were using hot block digestion for most materials, as this lab was running mostly seawater samples for the petrochemical industry, so they didn't need the high pressure microwave systems that we use for food samples. I was chatting with one of the lab technicians about the speciation of aluminum -- something that apparently nobody does in the entire industry -- and he said, "Aluminum is in everything." I replied, "Yeah, I know, especially food. Why do you think that is?" He smiled and replied, without even a hint of sarcasm, "Because it falls out of the sky 24/7." On another personal note, when we first published our story about the lab tests of chlorella sources, we got threatened by one of the companies who claimed we should stop talking about metals contamination in chlorella. They hilariously claimed their chlorella contained "ZERO" metals, and they said if we didn't stop talking about it, they would take some sort of action against us. The problem with their threat is that the laws of physics don't lie, and when we run your dirty, polluted chlorella through ICP-MS, we don't just sit around and make up the numbers. Those numbers are produced by the laws of physics, and you can't argue with the laws of physics, especially when the machine are calibrated so frequently.